The correct way to do dumbbell hammer curls. The biceps and forearms are the first muscles we see when wearing a t-shirt and if you want them to turn heads, you need to train them hard. Now, let’s get something straight… training hard doesn’t mean overtraining. You see, the biceps and forearms are relatively small in comparison to the larger muscle groups like back, chest, and shoulders; which means they are more susceptible to overtraining. Moreover, they don’t need to be annihilated but simply stimulated with few sets and reps a few times per week and no more. Biceps and forearms receive heavy stimulation from deadlifts, rows, pull-ups and any movement where pulling is required. But when you want to isolate your biceps and forearms, dumbbell hammer curls are the perfect exercise to make them massive and strong. Stand with a dumbbell in each hand with a neutral grip. Curl dumbbell with your left or right arm first while you exhale and slowly lower the weight down to the bottom and inhale. Alternate until you perform the desired amount of repetitions. You can do these seated or on a preacher bench. Never lock out at the bottom of a preacher curl type movement to prevent bicep injury. 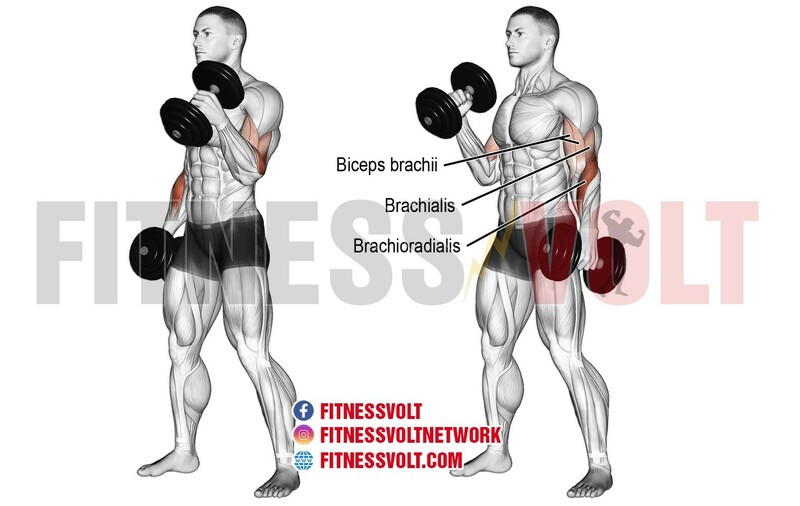 The dumbbell hammer curl targets your brachioradialis, brachialis and biceps. A little momentum is perfectly fine and even recommended to creates more stimulus overload.